← Pilots, Briefers, and Weather, Oh My! One of the books we produced at BluewaterPress LLC came to us from Captain LeRoy Brown. LeRoy lived the life all pilots would have wished to have lived, if they could have been as lucky. LeRoy, a fine gentleman of proper age, began flying before the big war, worked as a cropduster, started flying with National Airlines, and then after the merge, retired out of Pan American World Airways as an L-1011 captain in 1981. 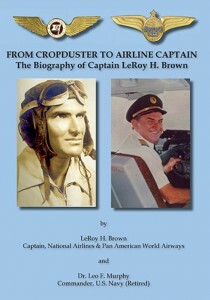 Dr. Leo Murphy, working on his own book about aviation in Pensacola, was introduced to LeRoy as a source. When Dr. Murphy began talking with Captain Brown, he quickly realized what a treasure he had discovered in this pilot, who was a legacy in aviation. In short order, bonds were formed, friendships cemented, and Leo agreed to put LeRoy’s story to words. For Dr. Murphy to capture the story of LeRoy’s time as a pilot throughout much of the last century was very fortuitous for all interested in aviation history. Below is an excerpt that is one of my favorite passages from the tales of LeRoy’s book, From Cropduster to Airline Captain. If you like this story, please check out the sample of From Cropduster to Airline Captain on our website. It can be found here – From Cropduster to Airline Captain. If LeRoy’s accounts of early flying, cropdusting, and flying the line for National and Pan Am really trip your imagination and you want to purchase his book, take 20 percent of the price with the coupon code – DUSTER14. From that very first dusting flight in April 1945, I flew multiple flights in that Piper Cub nearly every day for several months. Then fate, in the form of a kindhearted CAA inspector, intervened. To my complete surprise, he agreed. He told me to meet him at nearby MacAllen, Texas, on May 3, 1945 and rent an airplane there. He said that he would give me a check ride and that if I did well, he would give me a license. In the meantime, he told me not to fly any more. I said, “Yes, Sir.” At this point, I had about 440 total flight hours in my logbook. This inspector’s name was Samuel Dellinger and at 0800 on the appointed morning, I met him at the airport with a rented J4 Cub Coupe all preflighted and ready to go. I could have easily borrowed one of Stormy’s Cubs, but I had promised not to fly solo and I didn’t. Dellinger had me don a parachute and then told me to take the airplane up and give him a turn and a half spin in each direction. He would stay on the ground and watch me and emphasized that each spin had better come out on point. I was quite nervous but I got airborne, and performed a spin in each direction. Somehow or another they both came out on point. Quite proud of myself, I then landed but I could not find Dellinger anywhere. I asked a lady at the FBO where the inspector was and she told me that he had told her that he was going into town to have breakfast. I quietly waited and just as he returned, a Fairchild KR-31 flown by two sailors in uniform landed. The airplane was in terrible shape and I would not have sat under it for fear that it would fall on me. Dellinger walked over and said to them, “Are you guys actually flying this wreck?” They replied yes and he told them he wasn’t going to do anything about it but they were to get it out of his sight immediately. He walked away shaking his head. He then turned to me and said, “How did the spins come out?” I told him pretty good so he said, “Ok, well let’s go for a flight then.” After we leveled off at altitude, he asked me to do some S-turns across the road. I had never heard of that maneuver so he took the controls, demonstrated it to me, and then had me do it. He then asked me to do eights on pylons. Same thing, I had never heard of that maneuver either so he took the controls again, demonstrated it to me, and then had me perform the maneuver. This give and take repeated itself for several additional maneuvers and he never lost his temper or expressed his frustration at my not knowing the performance maneuvers required for a commercial pilot’s license, which I should have had memorized. I now owned commercial pilot certificate number 366103. Sadly, Dellinger was killed three months later while performing in an airshow during an airport dedication in Mexico City. For me, the fun could really begin. I had been breaking the law of gravity and the laws of the CAA my entire flying career and finally I was licensed. My logbook shows that the very next day I went back to crop dusting for Stormy. This entry was posted in Aviation, Aviation History, Flight Instructing, Flying and tagged airplanes, aviation history, CAA inspector, Captain LeRoy Brown, cropdusters, discipline, Dr. Leo Murphy, Florida, Getting a License, inexperienced pilots, judgment, L-1011, learning to fly, memories, National Airlines, open cockpit biplanes, Pan American World Airways, professional pilots, Samuel Dellinger, Stormy, taildraggers. Bookmark the permalink.